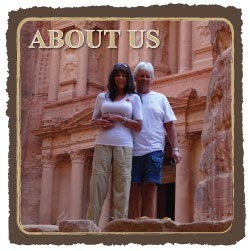 Please scroll to toward the end of the page for photos of us on the beach. (Due to a weak Internet signal today we get "ghost" photos that appear in the post that are impossible to remove). Only a mother could love this face! In many ways, the first year of our lives traveling the world went by quickly. When we review what we've experienced in this first year, it's hard for us to imagine that we managed to see so much. In essence, it's comparable to being on vacation for 52 weeks, a lifetime of one week vacations for many. Any regrets? Over packing. But, we understand and accept that we had no concept of how hard it would be to travel with so many bags and, how much we'd actually need to have with us. Many warned us. This affectionate camel leaned on his owner's shoulder when I approached. We had to learn on our own, as with many of life lessons, donating and dumping along the way with only one large suitcase, one carry on and one laptop bag remaining for each of us. And yet, it's still too much with 30 additional pounds to unload before we leave Kenya in a month. We'll figure it out. Any other regrets? None. We both know for sure that we picked the right person to travel with! We get along so well; making decisions together, laughing as much as possible, still enjoying romantic evenings and magic moments together, more often than one might imagine. me holding on one handed, too risky up that high for an old timer like me. Only in a rare instance does Tom get grumpy. I ignore him and his occasional grumpiness goes away in minutes. He says I don't get grumpy. But, now and then I may "think grumpy," usually keeping my mouth shut and, it goes away. I suppose grumpiness boils down to this...keep it to yourself and it goes away. ﻿﻿﻿﻿﻿For us, other aspects of getting along is; the willingness to admit to being wrong, apologizing when necessary, complimenting and appreciating each other and sharing equally in tasks and responsibilities. And, we've found that if we don't like elements of our surroundings, say it once, either fix it or if it can't be remedied, "shut up." Complaining provides no benefit to our lives. Tom spotted them coming and alerted me to grab the camera. I ran like crazy to catch up with them to take these photos. The cost for a ride, up for negotiation, was Kenya Shillings $2000 each, US $23.56 for two. Darn, I would have negotiated it down by half. Most of my whining can be accomplished right here! I don't need to get Tom wrapped up in it! Besides, he reads the posts everyday so there's never a doubt about what's annoying me, which in most cases, is about biting or poisonous creatures. So, Happy Halloween to those who engage in Halloween activities! Little did we know that our relaxing mini vacation would behold such wonders for us. Little did we know that our 3 day stay at a the beach side resort of The Sands at Nomad would catapult us back into "safari mode" constantly on and the search for yet another treasure, giggling with delight over every find. We'd imagined considerable time reading, lying by the pool, dining, walking the beach and lounging in air conditioned comfort at will. We've done little of any one of these. Instead, we've been on "the hunt" for the next sighting of wildlife with the same enthusiasm and passion we shared while on safari, only weeks ago. Our eyes continually scanning the sea for a glimpse of perhaps a dolphin, a jumping fish, or a huge fisherman's catch. Walking on the beach yesterday afternoon, Tom shot this appearing footless photo of me. Actually, I was wearing those ugly water shoes, grateful they were hidden in the surf. my shadow as I'm taking the photo. Too busy to edit photos right now! pleasant walk on the beach after 4:00 pm yesterday, as the day cooled. ﻿Living in a third world country has its hardships. However, the vast majority of its land and resources are untouched with wildlife living free in it's natural habitat, not off the hand of man. In Kenya, it's the local people continue to work hard to keep their wildlife free and we, as visitors, have been blessed with the opportunity to relish in all that they've worked so hard to achieve. Thank you, Kenya! And, thank you, The Sands at Nomad Resort for honoring the integrity of the land, it's creatures, it's people and the preservation of its resources in the manner in which this exquisite property is maintained. Finding the Colobus Monkeys beside us at the pool put me on a photo taking frenzy. Note this Colobus' long white sideburns. I felt like a kid in a candy store while taking these Colobus Monkey photos. Another Colobus with the long swatches of hair. Not all of them had this particular marking. When we first arrived in Diani Beach, Kenya on September 3, 2013 within our first several days we'd posted several baboon photos. There were monkeys in the yard, along the highway and swinging from trees. did a quick 20 minutes on one of the chaise lounges in our front yard. On September 8th, a monkey ran through our yard that most certainly, was a different breed than baboon, with its distinct black and white hair. Unfortunately, I didn't have the camera handy to capture this fast moving monkey. Researching online, we found that most likely, it was a less common Colobus Monkey. The chaise lounges at our ocean cottage where fresh towels are delivered each day. With no photo when we posted on September 9, 2013, as you'll see clicking on this link, I copied a few photos to post, noting in the caption that these were "borrowed" photos and not our own. Grass in Kenya is an odd variety of grass, tough underfoot, appearing as crab grass. only this type of grass to grow. Since our original sighting, we hadn't seen another Colobus. Nor had we seen any while on safari in the Masai Mara where we saw a few baboons with babies but no other breeds. In the late afternoon, while on the veranda this Sykes Monkey came to call. Having seen and photographed so many baboons since arriving in Kenya, we've become used to seeing them, as have the locals, hardly giving them any attention. I suppose it's comparable to of us in other countries paying little mind to dogs unless, of course they're dog lovers. Stopping for a nibble before getting too close to us. Shortly after checking in at The Sands at Nomad Resort yesterday morning on a 3 day anniversary celebration of our traveling for one year, we knew we were in for a treat when not only Sykes monkeys frequently appeared on our veranda, but we ran into several families of Colobus Monkeys while we lounged by the pool in the afternoon. drink before making the official appearance. Apparently, the proximity of many dense trees surrounding the pool provide a natural habitat for the Colobus. No more than 5 minutes after we were situated in the padded shaded lounge chairs, Tom said his usual, "You better get the camera ready!" as he pointed in the direction of multiple Colobus Monkeys playfully swinging in the trees. I squealed with delight putting my hand over my mouth to avoid disturbing them. Finally, she was ready for a photo, not hesitating to make eye contact. Although used to seeing humans in this busy resort, they are not willing to allow anyone to get too close including familiar staff members. With strict rules to avoid feeding them due to biting risks and to maintain their natural foraging instincts, they remain wild animals, not domesticated playthings intended to entertain tourists. Early this morning as we left our cottage for breakfast in the main restaurant. Keeping this in mind as we've learned, I kept my distance, gingerly stealing close enough to take these shots. They didn't seem to mind at all but refused to be complacent by giving me more than I deserved of their time. Our time here at The Sands at Nomad Resort is heavenly; the service, impeccable; the food, divine; the scenery, breathtaking; and the ocean, constantly changing colors, tides, waves and winds, our eyes affixed to its mysterious wonder. Sunny view from our veranda to the sea. Three days will go quickly but leaving here will not be filled with "end of vacation dread." Our mail is handled, our bills are paid, our house is clean. After a 10 minute trip to the produce stand, we'll be stocked with food for another week, having planned well in advance. A morning view of our tucked away ocean cottage. Our 2 little temporary dogs, Jessie and Gucci, will be waiting for us and once again in no time, we'll be settled in finding contentment wherever we may be for our last month in Kenya. Thank you, Colobus Monkey! Now I can go back to my search for the Dung Beetle! This cat came to visit today as we sat on the veranda of our beach cottage. this guy stopped by for a visit outside the window of our indoor living room. 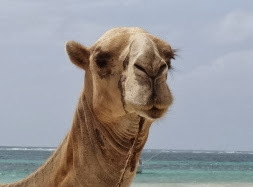 Over the past several weeks, we've visited many of the resorts in Diani Beach hoping to find a the perfect spot for our 3 day one year anniversary of leaving our old life behind to embark on a new life traveling the world. Tom spotted this monkey outside the window. I couldn't grab the camera fast enough. to humans at the resorts. Look at her/him looking for our fruit plate! Carrying the love and support of those we left behind with us, we've found this experience to be a bounty of learning experiences, life changing lessons, all enriched with endless surprises. and orange mango juice. (I politely declined but Tom enjoyed his). This morning, after moving into a private beach cottage on the beach of the Indian Ocean at The Sands at Nomad, we knew we'd selected the resort that most fulfills our desires for this special celebration. This pool bar is open 24 hours a day for the middle of the night drinkers. in the padded lounge chairs under the shade of a giant umbrella. The bathroom is well equipped plenty of towels, toiletries, robes and a bidet, of course. Our new living area with comfortable furniture and a TV! Side view window of the living area. Our plans for our 3 night stay is simple; relax, walk the beach, lounge at the pool where there are many shaded areas, take scenery, food and wildlife photos, stay cool in AC from time to time, dine in the fabulous outdoor restaurants, meet new people, and celebrate the first year of our "stepping outside the box" to explore countries we'd never dreamed possible. This is the beach in front of our cottage. colorful contrast. This photo was taken as the tide was going out. Tom catching a few rays in the scorching sun. Not too much though. We've seldom lounged in the sun these past 5 months for our former "usual one hour" since arriving in Italy on June 16th due to the bees and flies. In Kenya, the only sunny areas are directly on the grass where the likelihood of a sting is greater. (Both of us are seriously allergic to hornets, certain bees and wasps. A bite can be life threatening which surely attributes to my skittishness of being around biting insects. More than once I've been rushed to an emergency room as a result of a sting. Tom's only been stung once but also had to go to a hospital. Thus, our excessive caution). Every so often, we look at one another and say, "Can you believe we are in Kenya?' We shake our heads and smile, never taking our current location for granted. found to be the best connection we've had in Kenya thus far. Thank you, The Sands at Nomad. Surely, I could have more neatly arranged my plate (Tom had the same minus avocado and tomato) but the enticing smell of the cooking chicken made me anxious to have dinner, I just threw it on the plate. Isn't that what we all do? Coconut Crusted Parmesan Chicken with sliced tomato, avocado and green beans. In the side plate is our usual coleslaw. All the vegetables were purchased fresh yesterday from the vegetable stand down the road from us; the cabbage, carrots, tomato, avocado and green beans were delivered as we arrived, by a guy on a motorcycle with colorful bins stacked high on the back seat. Making delicious dinners every night is and always has been an important part of life's enjoyable experiences. I'll admit that in this heat and humidity, I often wish there was something in the freezer that I could pop in the microwave (No room in freezer for leftover meals. No microwave). We prepare most of our meals with the intention of having the same meal two nights in a row in order to cut down on the prep time. Thus, we prep one day leaving ample ingredients in order to cook separately each of 2 nights. Last night, I made a fresh batch of Coconut Crusted Parmesan Chicken and tonight, I'll make the second freshly cooked batch. The green beans, cabbage and carrots are already cleaned and cut, ready for tonight. I know this may seem to require the same amount of work but it actually saves time and effort. The prep time for this meal was 20 minutes, mostly spent cutting the cabbage and carrots for the coleslaw. In many countries, you can purchase bagged shredded cabbage and carrots. Not the case in Kenya. The cooking time is 21 to 25 minutes. Plus the time it takes to snip the ends off of the green beans, uses 10 of the 20 minutes. The boneless chicken prep was minimal: remove visible fat, rinse in purified water (or your safe local drinking water), place covered on paper towels in refrigerator. The remainder will be explained in the recipe below. This recipe I concocted some time ago is now one of our favorites, totally within the realm of my restrictive diet: gluten free, grain free, sugar free, starch free and low carb. Place two eggs in a flat bottomed bowl, beating with a fork for 30 seconds. Place coconut flour, grated Parmesan cheese, salt, pepper and garlic powder in a separate bowl. Dip one chicken breast at a time into the coconut flour mixture first, then the beaten eggs, then back into the coconut flour mix, coating thoroughly. Place prepared coated breasts on waxed paper or parchment. Prepare a skillet with equal portions of olive and coconut oil, to approximately 3/4 inch deep in the pan. Heat skillet with oils on medium high heat until hot, watching carefully. Once oils are hot, place all the coated breasts evenly arranged to cook. Turn down the heat to medium. In about 7 minutes, the bottom side will be brown. Carefully flip ensuring not to knock off coating in process. Cook another 7 minutes, checking the bottom from time to time. Once both sides are brown, place a tight fitting lid over pan, lower the heat one more notch and cook, turning once more another 7 minutes. During this 21 minute cooking time, toss salad, cook green beans, etc. After the final 7 minutes, take a sharp knife, cut into the thickest breast of the 3 checking if done...no pink. If not done, cook with lid on, in two minute increments. It will cook quickly at this point. Don't overcook. Once done drain on paper towels as plates are prepared with vegetables and serve. Enjoy. Triple dip the chicken in coconut mixture and egg, fry in skillet, turning to avoid burning. Drain on paper towels. Today, we're packing for our vacation starting tomorrow: all of our digital equipment, casual dressy for dinner with shoes and accessories, shorts and tee shirts for breakfast, bathing suits and cover-up for pool, water shoes for walking the beach, undies, lounge wear, toiletries and pills. That should do it. I must admit that I'm choppin' at the bit to get into some air conditioned comfort and to feel pampered for a few days. That hasn't been the case since we were aboard ship, disembarking in Venice, Italy on June 16th. Overall, we've gotten used to being sweaty and sticky, especially with me covered in repellent 18 hours a day. We'll be back tomorrow by late afternoon, our time, with photos of our accommodations, surroundings and hopefully wildlife as we spend 3 nights celebrating a full year since we left our old lives to begin anew on October 31, 2012. 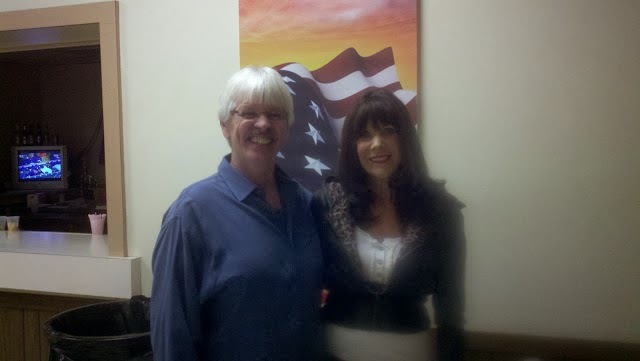 This photo was taken the night of Tom's retirement party on October 27, 2012. At this point we only used our smart phones to take photos. Little did we know at that time, how much would change, how much we would change, how important clear photos would mean to us and how much we had ahead of us. How does one unload their entire lives and travel the world for years to come? Now we know. Tom's retirement party was a year ago. Its hard to believe. We so appreciated all the wonderful friends and family that joined us for a highly memorable event. A special thanks to daughter-in-law Camille for all of her hard work at the party while I was busy trying to communicate with guests after losing my voice and still feeling poorly. Here's the link from the post for the night of the retirement party if you've never read it or would like to see it again. 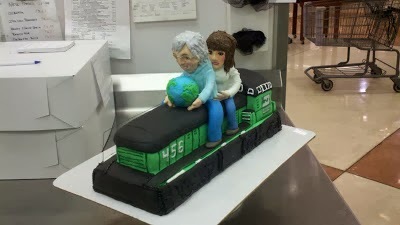 This was the cake I had made for the party by an amazing cake decorator, surprisingly edible, depicting Tom's 42 years on the railroad and our plan to travel together to see the world. Little did we know what adventures were yet to come. Little did we know how happy we would be. When traveling for the usual vacation periods of one or two weeks, most tourists have little need to go to an ATM during their stay other than to use it to exchange a small amount of the local currency required for locally owned standalone restaurants, tips and taxi fare (always paid in cash in Kenya). With the universal acceptance of credit cards worldwide and preparedness with some cash from their home location, there is little need for additional cash during their stay other than those listed above. Many resorts and hotels, especially the larger chains, may accept certain forms of currency. From our experience, overall, they prefer the use of credit cards. On occasion, as in the case of dinner a few nights ago, the restaurant didn't accept any form of cash. We'll see more and more of this in the future with the growing amounts of counterfeit money and also, the risk of theft from cash drawers. However, in Kenya, we've found we frequently need to use cash, Kenya Shillings (Ksh or KES), to pay for many services. Most assuredly, this is a result of our long 3 month stay. For security reasons, we've chosen to visit an ATM more frequently rather than carry large sums of cash with us. At a cost of US $5 per transaction charged by our bank, we felt the security aspect has well been worth the added expense, totally approximately US $50 over the 3 month period, a small price to pay for the security of carrying lesser amounts of cash at any given time. It's important to determine the fees one's bank charges in foreign countries (as well as in one's home country!). In Kenya, we've been able to easily determine "b" and "c." But, "a" has been tricky, as in the case last night on our way to dinner. With our upcoming mini vacation beginning on Tuesday, we knew we'd need more cash for the many tips for service personnel which may not be added to credit card charge slips in Kenya. Whether it's a waiter for dinner, a bartender, a hotel valet or maid or a guide, cash is the only method of payment. On our way out to dinner last night, we asked Alfred to drive us to an ATM we'd never visited in the past, less of a drive from the resort we were visiting for dinner hoping to save a little on cab fare and driving time. Knowing full well that there was absolutely no reason our cash request would be denied, we still approached the machine with a degree of hesitation; the location wasn't ideal and, would the machine work? Entering Tom's card, we hesitated. When it promptly kicked out the card but still proceeded with a request for the PIN and desired amount of cash, we became worried. It began the processing including the rifling sound of money dropping down, but none was in the slot. With our hearts pounding, we waited. Moments later, a receipt popped out, saying "transaction incomplete." We left, asking Alfred to take us to our usual ATM near the Nakumatt Grocery at the local Barclay's Bank, a known reliable ATM. Once there, we received our desired amount of cash without incident and moments later, we were heading in the direction toward our reservation. Had a new tourist had such an incident, they may have assumed that none of the ATMs would work (or that something was wrong with their card), although it clearly stated that our type of card was accepted. If this resulted in an inside visit to a bank, the fees would have been considerably higher, both in exchange rates and service fees. Thus, it certainly is worthwhile for tourists to have a "backup plan," in this case another cash machine location. Also, it would be wise to try an ATM directly at a bank that is open, should anything go wrong. In our case, it was Saturday evening at 6:00 pm. The bank had been closed since noon. We'd found this link for local ATMs but didn't choose to take the time or expense of taxi fare to try more of them. With our ready cash in hand, tomorrow we'll pack the same duffel bag for me and the same carry on bag for Tom that we used to go on safari, although this time, our mini vacation won't require safari boots and BugsAway clothing. Tuesday morning by 10:00 am we'll be off, sharing photos and stories each day. It's with no disappointment that we're not embarking on another safari at this time, keeping in mind that life will be comparable to one long safari when we move to Marloth Park/Kruger Park, South Africa where we'll live for another 3 months while many animals will visit us at our new home at the rather remote location and we can take daily game drives at will. We've made a point to continue to enjoy every remaining moment of our remaining 34 days in Kenya, as we lounge in our outdoor living room on another sunny, hot, humid day with the precious little dogs, Jessie and Gucci at our feet, the birds singing, the monkeys occasionally swinging through the trees and bugs nipping at our bare feet. Life is good. P.S. A few of our readers have asked that we share photos and recipes of meals befitting my diet. For dinner this evening, we're making one of our favorite dinners, Coconut Crusted Parmesan Chicken. Tomorrow, we'll post the recipe and photos of our meal. Also, I downloaded yet another excellent book detailing the medical research that has been discovered over a period of many year as to why my diet is so highly instrumental in vastly improving health (and coincidentally, weight issues) in many ways including preventing and possibility being instrumental in healing brain deterioration (dementia and Alzheimer's Disease). The book is entitled: "Grain Brain, The Surprising Truth About Wheat, Carbs and Sugar - Your Brain's Silent Killers" by Dr. David Perlmutter, a renowned neurologist and researcher. As I read this book, I'm beginning to understand why my memory has also improved 100% in the past few years since adopting this way of eating. Interesting. This mom had a baby on her opposite side. We waited hoping the baby would appear. The mom, seemingly aware of us, never allowed the baby to make an appearance. than 15 feet long. Although less than 20 feet from us, we cautiously stood on an steep embankment, impossible for him to climb with his size and girth. Another hippo is swimming in the river while this one was sniffing for breakfast. Anderson chuckled when we zoomed in to get this shot of an impala during our first few minutes in the Land Cruiser after he'd picked us up at the airport. He said we'd see so many of these and other animals in the antelope family we'd soon lose interest in taking their photos. How right he was, although these graceful animals are enchanting to watch. Young lions lounging under a tree on a beautiful morning. Mom keeping out a watchful eye while her brood lounges. From time to time, she nodded off, quickly startling herself awake. Grunt. Life is hard for a "Retired General." This one may have been newly banished as he'd yet to meet up with other such males. He looked forlorn and miserable. We took at least 10 shots of this exquisite male lion looking satisfied and dosey with the remains of his zebra meal behind him. Anderson said that most likely a female killed it and he took it from her. The male's MO is to watch females hunt in order to steal their catch although when desperate they'll hunt for their own meals. When shooting multiple shots of one scene, many shots may look similar or at times almost identical. Luckily, I have access to a link where I can review all of the photos I've already posted to ensure I don't post lots of duplicates, since each photo has its own unique number. Although on occasion, as mentioned in the past, I may make an error or simply want to re post a shot. While on safari, we kept took over 600 photos, keeping approximately 500. We posted many of those 500 over a 13 day period at about 20 per day, leaving us almost half of them that our reader haven't seen, mainly due to the appearance of many being duplicates. From time to time, we'll post a few of these as we've done today. The elegant lobby at the Diani Reef Resort and Spa. The elegant offerings at Diani Reef Resort and Spa were breathtaking. Diani Reef Resort and Spa. Our intent had been to arrive in daylight for the benefit of better photos. Perhaps, we'll return during the day to partake in the several additional restaurants, the offered pool lounging and the free WiFi. Dining out three times a week has made a world of difference to us. Yes, it's a pain to getting ready to go out each time; the heat, the repellent, plus trying to figure out what to wear. But, we've found that once we're on our way in the taxi, we're always happy to be on our way. Tom standing in front of the popular local Baobab trees located in the lobby area of the resort. That's my purse, not his, although on occasion he does carry it for me. In our old lives, we seldom dined out. Many of our friends lived in our neighborhood making staying in dining with them easy and fulfilling. Plus, we'd had our fill of nearby restaurants, preferring to dine at home. Although this appears to be an exterior photo, it was actually taken from inside the massive courtyard in the lobby area. Now, with a multitude of amazing resorts with phenomenal restaurants within a 20 minutes drive costing no more than KES $1500, US $17.69 for the round trip drive including tips, dining out certainly has it's appeal. As we approached the bar area where we had drinks and excellent service. With many highly rated standalone restaurants nearby, we've been tempted to try them. The problem has been my restrictive diet. The standalone restaurants mainly have "cooks" managing the preparation of the meals. But the fancier resorts have trained "chefs" who totally "get it" when I say: no starch, no gluten, no grain, no sugar. A view down the hall as we sat on the bar stools. There is one fabulous seating area after another offering privacy or socialization with easy access to MiFi. Although appearing empty, the huge property had many guests enjoying the facility's wide array of areas. Still, with most of the professional "chefs," I must explain the fact of "no rice, no corn, no corn thickeners, no potatoes, no potato thickeners" which is often difficult for them to understand when most gluten free diets do include corn, potatoes, beans, rice and gluten free grains, none of which I am able consume due to the high carb content. This was Tom's dinner, tempura pork loin with a Japanese seasoned side salad. Now pain free after over 2 years of eating this way, I can sit in a bumpy safari vehicle for 8 hours a day with nary a moment's thought of pain, or walk many miles for hours on uneven pavement to see Petra in Jordan, walking up and down steep cobblestone walkways in Mikonos, Greece and on and on. The rice, miso soup and sauce was included in Tom's meal. We shared an delicious appetizer before dinner but were so hungry we forgot to take a photo before devouring it! Need I say more? No type of food is worth the pain returning and never will be. Thus, the fancier restaurants, although more costly, are worth it to us. Most likely, the restaurant/resort we visited on Thursday night was the most expensive thus far. The total for dinner, drinks and tips at Diani Reef Resort and Spa at Sake Restaurant, was KES $7566.70, US $89.23 which included some cocktails for Tom at KES $763.20, US $9.00 each. As is the case in most of the resorts, the cost of cocktails is high with soda and beer less so. Tom worked for 42 years to earn this retirement. He can have all the cocktails he wants, although overall, he's a lightweight drinker. I don't drink any alcohol, instead ordering bubbly water with lemon or lime. The moment we entered the gorgeous resort, we anticipated an enjoyable evening and we were never disappointed for a moment. From the welcome reception we received upon entering, to being greeted and chatting with Susan, the assistant GM and Mohammad, the GM when departing, we were enthralled with the quality of service. Our table after our entrees were served created an eye catching presentation. I requested a sauce made without gluten or sugar and this sugary sauce was removed. The ambiance was over the top, one of the most beautiful resorts we've yet to see. The design and the décor were developed and embellished to the utmost of creativity, with a theme of a warm elegance unsurpassed in the resort industry. After an exquisite dinner in the Japanese restaurant Sake, Susan and Mohammad invited us to return for a full day's enjoyment at their pool where they'll reserve a padded lounge chair for us. We'll be able to use their free WiFi, and dine in another of their several restaurants at our leisure. We look forward to taking them up on their offer soon. Yes, folks, we're going on another three night "vacation" starting on Tuesday, October 29th, returning on Friday, November 1st. Some might call it a "vacation within a vacation" but for us it is the perfect way to celebrate on October 31st, the anniversary of our first full year of travel after leaving Minnesota on Halloween, October 31, 2012. Tomorrow, we'll share our plans and of course, next week amid our "vacation" we'll we writing and posting stories as they occur. Booking for the future...Safari in four days!